What should Sasuke be with? During Sakura and Sasuke's first encounter in the Shippuuden series, what do te think was on Sasuke's mind when he first laid eyes on Sakura? On a scale of 1 to 10, how much do te rate SasuSaku pairing? la scelta dei fan: 10!!! What if Sasuke and Naruto did not exist? Okay,,, te guys... Please tell me te know a really nice SasuSaku fanfic involving older Sasuke and Sakura... I really those in my life right now.. Does Sakura still in Amore with Sasuke after Sasuke want to kill her ? Author's note: Gomen, minna! ^^"... I forgot to update.... Here's the fifth instalment..
“You look worried, Sakura,” Sasuke points out to her, as they lie on the couch. Sasuke slings his free arm – the one not entangled with Sakura’s – around her shoulder. “I’m sorry about that,” he whispers. [Two years have passed since Sasuke’s and Sakura’s wedding]. Sasuke had been away for seven months on business. But he was coming back tonight. Sakura smiled at the thought. She was dressed in the baby blue Chinese dress; Sasuke had gifted her last anno on their anniversary. She looked as beautiful as she had back then, even more, actually – her face had a proud and happy glow and her pink-hair was pulled back in a loose bun – so as to let her curls fall around and frame her face. Author's Note: Sorry for such a late update! I've been busy..Nyway, here's the 3rd chapter! ...He had married, Sakura... And the night that followed. He had remembered the fear of the unknown in Sakura's eyes and how he kissed them shut. “Trust me “he’d said.” I won't hurt you." He could still hear Sakura's moans and he could still remember the way she had entangled her fingers on his hair. “I Amore you, Sasuke," she'd told him. Sakura lay awake on the bed, her head against Sasuke's bare chest. She could feel rhythmic heartbeat beside her as the night inched slowly closer to dawn. She lay thinking about how lucky she was... Yesterday, she married the only man she had ever loved. So may times, she thought she had Lost him forever. When he was away in the war... When there was a bombing near the Konohagakura army... And in a very distant past, when he was with Naruto's cousin Karin. Author's Note: I don't own any of the characters in the show, they've been created da Kishimoto Masashi. Also, its a work of fiction (lol) and it bears no resemblance to anything that is happening on the mostra for real. Also, this is my first attempt at Scrivere mush, so please don't be too harsh with the review? "Aren't te a little old for action figures, Sasuke-chan?" Mikoto asked as she looked over her son's shoulder to see what he was doing. "You're almost eight now." "Pew, pew!" he said, making sounds with his mouth and waving his toys around in both hands. "You can never be too old for action figures, kaa-san. Are te tired of tou-san, yet?" Mikoto blushed, saying, "That's different, Sasuke-chan. Daddy isn't a toy." Sasuke pouted. "Sometimes I hear te calling him a toy." -During the campana, bell test, when Sakura fainted from seeing his head above ground, and the rest below, Sasuke waited for her to wake up, even though he probably knows he's wasting time. -When Sasuke and Naruto were fighting Haku, Zabuza went to attack Tazuna but Kakashi Hatake protected him and Sakura screamed. When she did, te could hear worry in Sasuke's voice when they heard her. One sunny morning in konoha there stood a walking couple.... err #cough#soon to be couple#cough#.Their names were Sasuke Uchiha and Sakura Haruno . a poll è stato aggiunto: Should I add my own SasuSaku video here? What was episode 3 called of Naruto the first series? 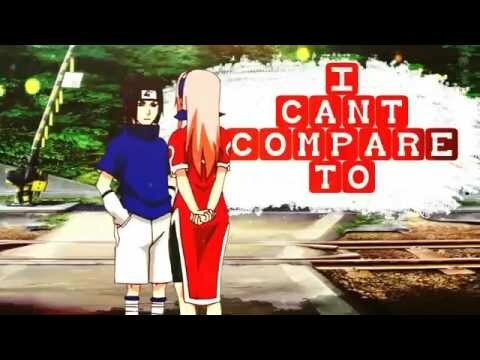 Sasuke + Sakura = ____________? It's obvious Sasuke has feelings for her too... Who else is tired of all the wait?